The morning of Day 3 found me in bed at the Ritz-Milner on Flower St. in downtown Los Angeles. 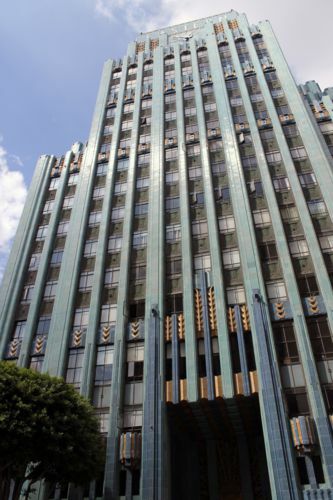 Quick note on the hotel: it’s a very affordable option for downtown LA, and for the price ($90/night), it’s a good deal as well. The Ritz-Milner is an older hotel, no doubt—the walls need better scrubbing, the bed was very hard, and the shower space is teeny. But otherwise, I was quite happy with it. Free wireless, a somewhat secret bar with great drink specials and a fifties feel, and a great location are huge plusses. But back to my morning . . . Ben, nicely dressed up for his presentation that day in the new duds he picked up at the Grove, was already at the Adobe Max keynote by the time I decided to head out. Early rising is not something I do, folks. It’s just not. I determined that my agenda for the day would be lunch, wandering downtown (my regular vacation practice, no matter what downtown it is), and checking out the Museum of Contemporary Art (MOCA). 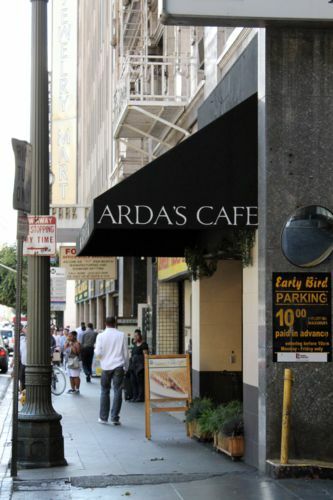 I opted for lunch at Arda’s Café, a sandwich and coffee shop right across from Pershing Square on 6th St. 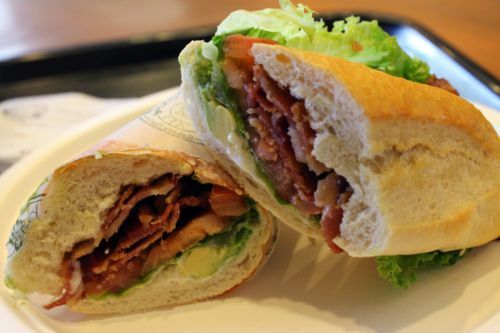 The sandwich of choice was a Californian BLT, which is shorthand for the addition of avocado, of course. That’s essentially what Californian means on any menu. And it was delicious. Avocado heals all wounds, especially ones no more pressing than hunger. Fed and happy, it was time to start that wandering. Near the Jewelry District, I found this interesting sight. That Mystery Girl mural was pretty awesome. No idea what buildings I was looking at there. Possibly my favorite shot from this trip. I love clouds on buildings. This was walking up Grand Ave., which is much steeper than it looks! 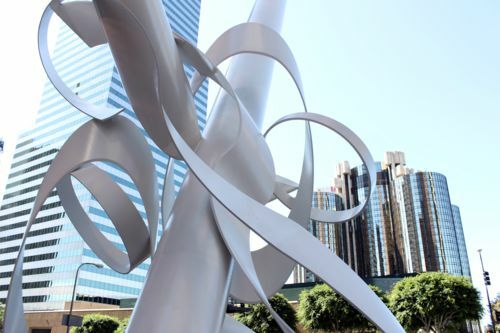 View from the sculpture at the Mellon Bank Center toward the Westin Bonaventure Hotel. 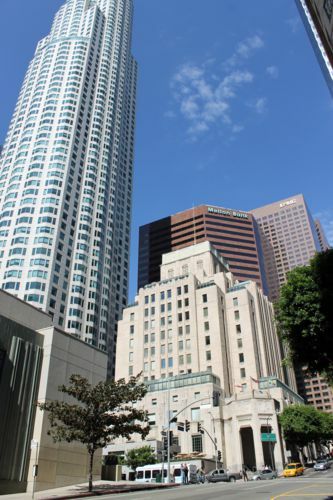 LA, by the way, has a ton of financial office buildings. 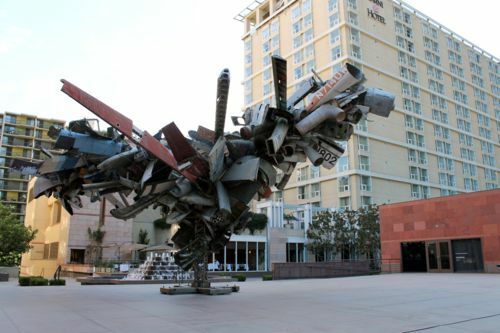 And with that odd sculpture, I arrived at the MOCA. It’s $10 admission. I enjoyed the artwork there, but the museum is somewhat sparse and the lighting on the artwork wasn’t the best. 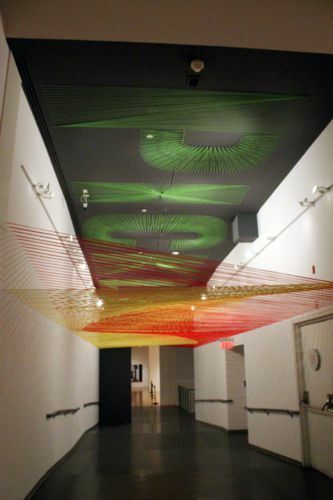 The most fun piece was an installation on the ceiling of a hallway, made out of yarn or string. That’s what it looked like walking under it, though imagine a lot more movement! And this is the whole piece, meant to mimic a hot dog. Pickle is the word spelled out on top, and the yellow and red stand in for mustard and ketchup. 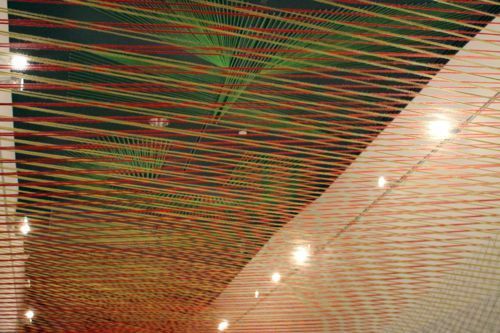 The shifting perspectives from the string’s angles made walking under it a delight. 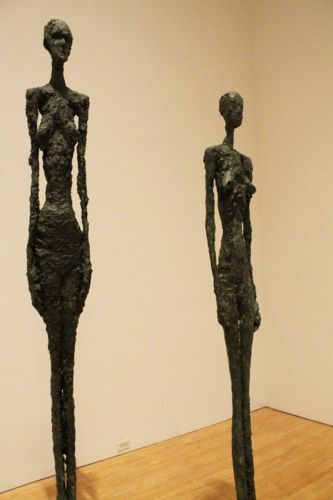 One of the most interesting pieces in the MOCA is in their standard collection, a pair of sculpted women who are awfully skinny and gray. I will give you no deeper ponderings than that. 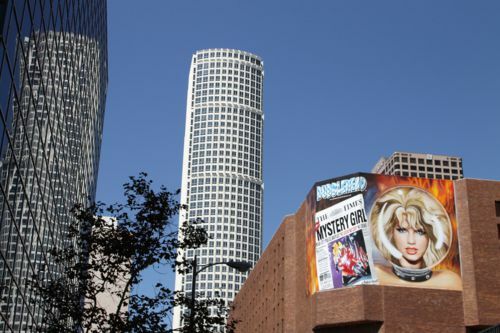 After the MOCA stroll, I decided to head back outside and take in a few more LA sights, making a wide circle back around toward my hotel by heading down 2nd St. to Broadway, then hanging a right once I hit the Jewelry District again. 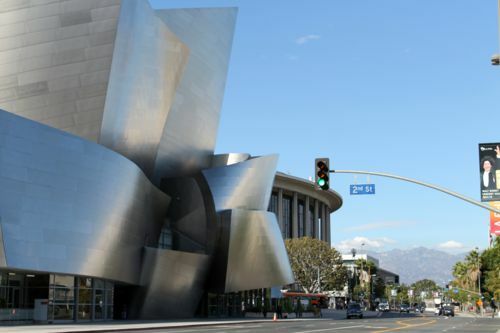 That’s the Walt Disney Concert Hall leading toward a view of the Los Angeles Mountains. Californians, believe me when I tell you that you won’t realize how much you miss mountains on the horizon until you don’t have them anymore. I miss them almost as much as I miss ocean views! 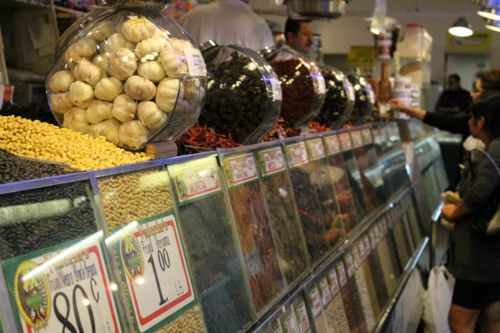 I came across the Los Angeles Central Market along the way, which is similar to the Los Angeles Farmer’s Market in that its focus is on foods in bulk but more on eateries. The difference is that the Central Market is all Hispanic foods and taquerias. I cursed myself for not having an appetite after lunch yet. Row of beans and chiles for sale at one store. I made my way south on Broadway, intrigued by the stretch of storefront that’s amazingly similar to San Francisco’s Jefferson St., full of tourist gear, quinceanera dresses, and cheap clothing. Broadway is not as cleaned up as Jefferson St., though. 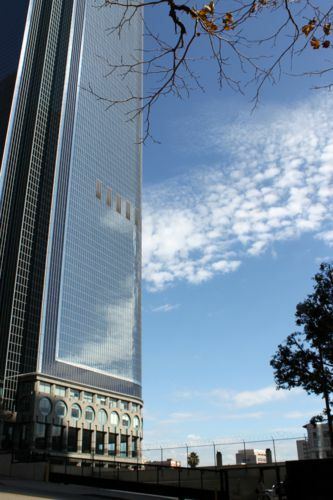 The Eastern Building, however, is a huge exception to that observation. It was a gorgeous building that I encountered on Broadway the next day. Later on this one, I crossed back over to Pershing Square. 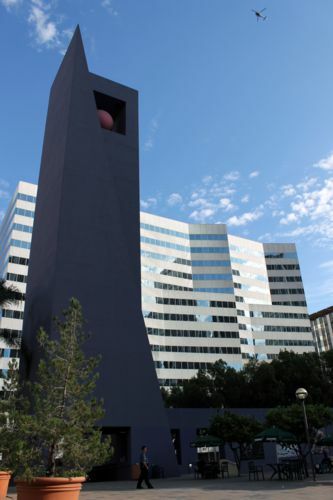 I really like that monument, though I have no idea as to its purpose. 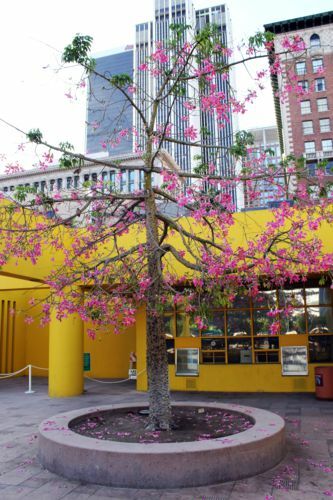 It definitely sets the square apart from its surroundings. So does the yellow courtyard that used to have some sort of function beyond hosting a cherry tree, I’m certain. Though, that’s not a bad function at all. There’s also a rather poignant quote from Carey McWilliams in the square on how Los Angeles is an eruption of different people of the world. It’s definitely worth pondering if you happen by. 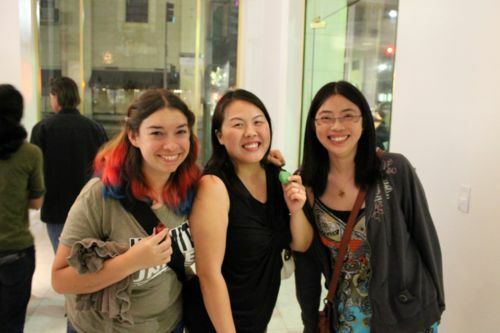 As night came, so did my chance to see two of my college peeps, Angela and Donna. 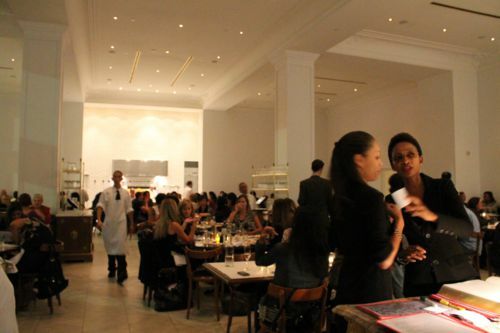 We made plans to try out Bottega Louie together, which happens to be a very popular and trendy spot on a Monday evening—there was a huge line, and the place was a well-oiled seating machine. 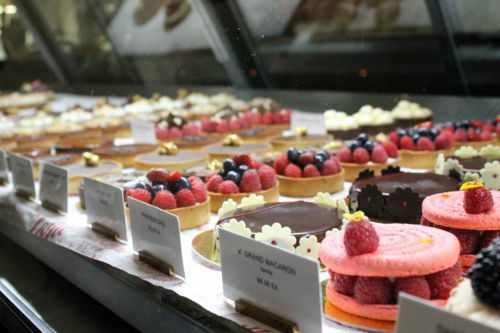 The many desserts in the bakery case. 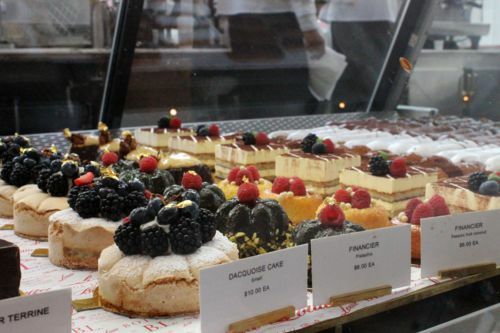 Just a few of the macaron options. 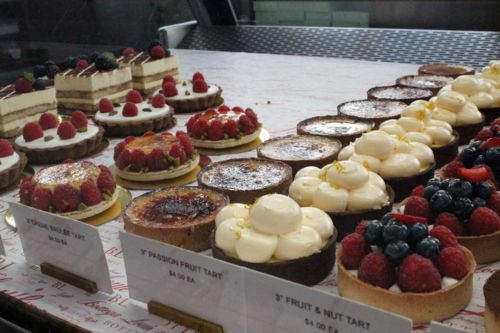 Bottega Louie is a mix of bakery and tapas restaurant, though they offer full-sized entrees as well. We opted for splitting a number of the tapas options and a pasta and rib dish. 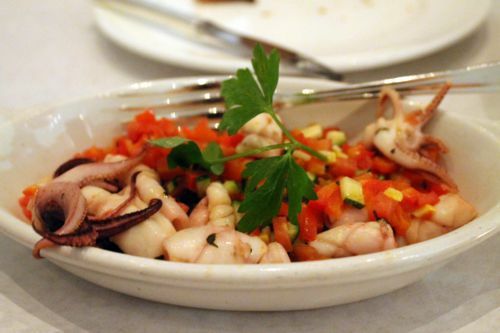 Possibly the most mundane option was the calamari with a vegetable salsa. 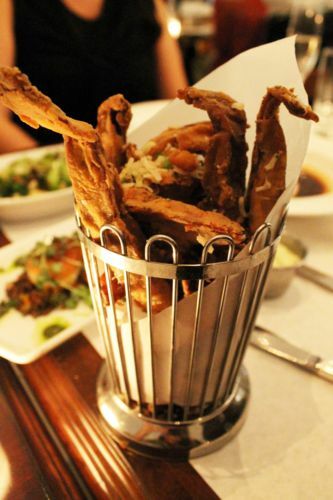 Everyone had to try the portabella fries, even me. My verdict? Still mushrooms and therefore unappealing, but the rest of my companions liked the fries well enough. 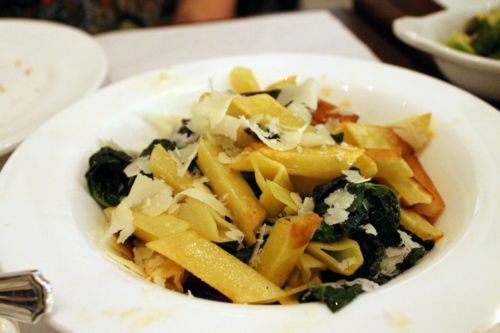 This trenne pasta with kale and parmesan was probably the best of the meal for me, mainly because the texture of the pasta was so intriguing. It was pan-sautéed, and the greens went so well with it and the simple sauce. Scratch that, those brussel sprouts in the back were actually the best dish for me. 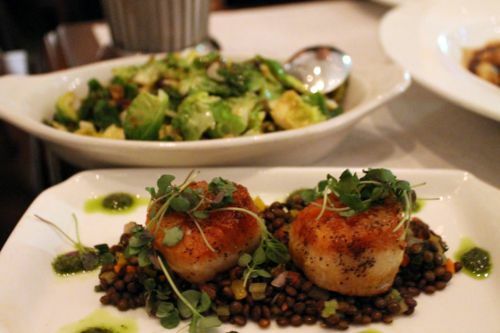 The scallops with capers were pretty good as well. 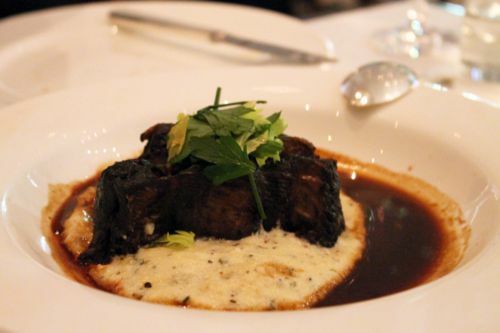 The short ribs with white polenta had a great, earthy flavor. 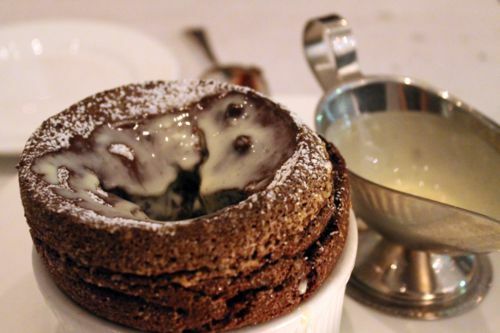 We did decide dessert was in order, and my second chocolate soufflé to try on this trip was soon at the table. I have to give the win to the Charthouse in the battle of vacation soufflés; it was a lot richer and more succulent than Bottega Louie’s. 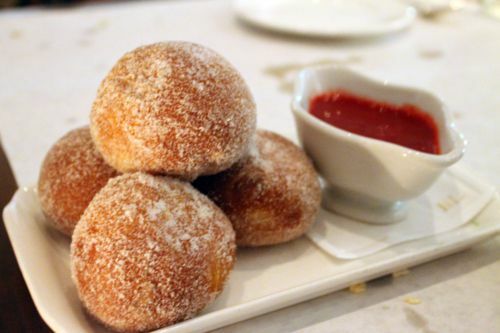 We also tried their beignets with a raspberry sauce. They were good, but I have nothing special to report on them. 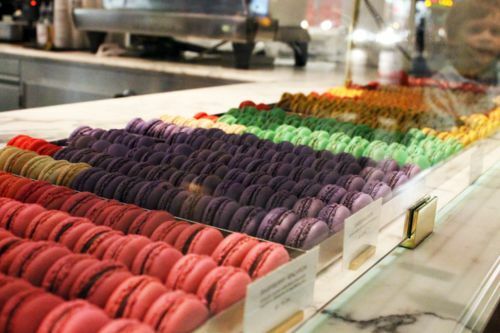 We tried to resist trying those macaron cookies, which are obviously Bottega Louie’s specialty and priced as any good fad food should be ($2/cookie! ), but Ben, Angela, and I feel victim on our way out the door. 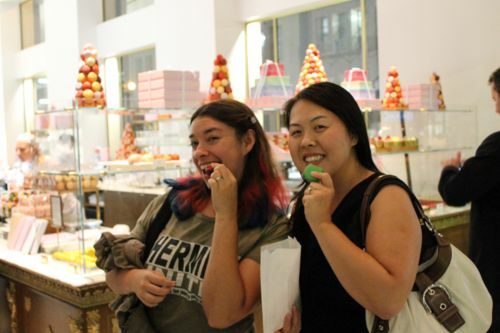 You can see their pyramids of macarons on the display case behind us. I tried the cinnamon caramel flavor, and for $2 a cookie, I expected to be unimpressed. Folks, it was divine. Now I know I love meringue already, so this sort of cookie is right up my alley, but that cinnamon caramel filling was much more luscious than expected. I only wish I’d bought the earl grey and pumpkin flavors to try as well! Donna, Angela, and I on our way out the door. The evening at Bottega Louie wrapped up Day 3 of our California trip, though Ben and I really ended it with a few drinks at that secret hotel bar I told you about earlier. On the next blog, I take you for lunch to the Tiara Café, then we’ll spend the afternoon investigating Little Tokyo and its plazas and temples. Dinner at Honda-Ya follows, along with my first taste of bitter melon, and then the evening ends with one of the best cocktails I’ve ever had. See you there! If you’d like to peruse more pictures of our trip in the meantime, head on over to our photo blog.